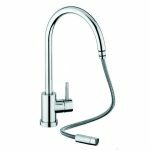 Chrome or brushed steel finish kitchen tap for your kitchen sink? 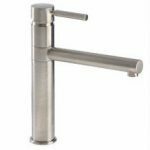 Taps And Sinks OnlineChrome or brushed steel finish kitchen tap for your kitchen sink? 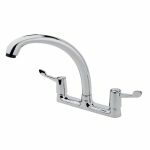 Home → Blog → It’s all in the detail: chrome or brushed nickel finish kitchen tap for your stainless steel kitchen sink? 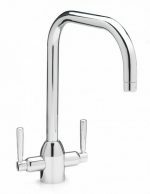 It’s all in the detail: chrome or brushed nickel finish kitchen tap for your stainless steel kitchen sink? For convenience we have come up with a summary table of the appropriate colour finishes of kitchen Taps (i.e. 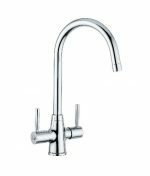 whether chrome kitchen tap or a brushed nickel kitchen tap) that would go with all the Carron Phoenix Stainless Steel Sink Ranges (see below). Polished kitchen sink → chrome kitchen tap. This way you are matching the shiny chrome of the kitchen tap to the polished finish of your sink. 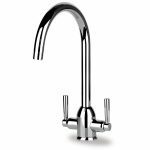 In the first example you have the polished finish of the Carron Phoenix Isis 150 with the Carron Phoenix Maya Kitchen Tap in chrome. The second example shows the Carron Phoenix Polished Lavella Kitchen Sink with the San Marco Elmira Tap in chrome. You can see that the polish of these sinks is so shiny that a brushed nickel kitchen tap would not look right with a polished kitchen sink. Not as Polished / more grain in the stainless steel Kitchen Sink → Chrome kitchen tap OR Brushed Nickel Kitchen Tap. The beauty of a sink like this that falls in between truly polished or truly ‘stainless steel’ means that you can put either finish of a kitchen tap with your sink and it will still look really well. Sometimes a sink is described as ‘polished’ but due to the grain in the stainless steel a brushed nickel kitchen tap could look equally well with it. By grain, we don’t mean that the stainless steel is inferior, it may well be that it is a thicker stainless steel, e.g. the Vela, or just produced differently, e.g. the Adelphi. If you love the look of stainless steel then this might be more appealing to you than a more polished sink. In the first example on the left we have the Carron Phoenix Maui Kitchen Sink with the the San Marco Vegas Kitchen Tap in a brushed nickel finish. In the second example we have the Carron Phoenix Zeta Kitchen Sink paired with the Carron Phoenix Dante Kitchen Tap in the two finishes (Brushed Nickel on the left and Chrome on the right). You can see that either Tap finish matches this particular sink. Matt finish / all grain in the stainless steel Kitchen Sink → Brushed Nickel kitchen tap. Matt refers to a brushed steel finish (patina) and is an intentional finish. My recommendation is that you put a Brushed Nickel finish tap with this Matt finished sink. and thereby the two components blend seamlessly together. In this example on the left you have the Carron Phoenix Vela Kitchen Sink with the Carron Phoenix Lucida Kitchen Tap in Brushed Steel (Kitchen being renovated – unfinished in picture). 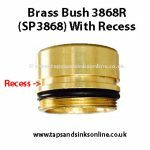 Undermount stainless steel sink – whether polished or matt → Any kitchen tap finish. 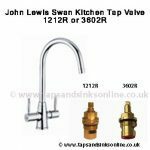 As the kitchen tap never comes into direct contact with the sink (the tap is situated usually in the worktop) it doesn’t matter what finish you use.